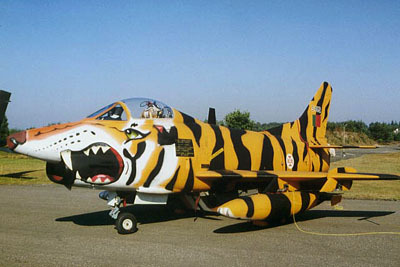 On this page you will find pictures of military aircraft painted in colourful outfits. During air shows the display of special demonstration aircraft, solo or as a team, draw much attention. Sometimes they are painted in fascinating colours. Special paintings on aircraft are also often used to mark some kind of celebration. This could be the jubilee of an air force or squadron, the retirement of a certain type of airplane or the number of flying hours of a particular aircraft or squadron.